Home » What's New » MACULAR VISION-HELP! 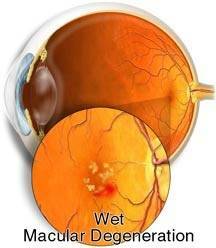 REDUCE YOUR RISK FROM MACULAR DEGENERATION! Find Out Which Foods and Supplements Will Help. Age related macular degeneration (AMD) is associated with a slowly progressive deterioration of central vision for which there is no cure. It is the leading cause of irreversible vision loss among the elderly. The condition may lead to severe loss of central acuity, such that the affected may lose ability read, drive a vehicle, or recognize familiar faces. However, as in many disease states, prevention may be possible and every person with AMD or at risk for AMD should understand the basic principles. There are a number of risk factors for AMD, including genetic inheritance, advancing age, smoking, and high blood pressure. Unfortunately, many people that get AMD or are at risk for the disease don’t have any risk factors that are under their control, except possibly one: nutrition. In this article, we’ll review two landmark studies linking nutrition to AMD and we’ll provide specific nutritional advice to those with AMD as well as those at risk for the disease. Ophthalmologists and vision scientists at the Massachusetts Eye and Ear Infirmary published the results of a study investigating the relationship between dietary factors and AMD in the Journal of the American Medical Association in November, 1994. This study found that individuals who had the highest consumption of vegetables rich in carotenoids (lutein and zeaxanthin) had a 43% lower risk of developing AMD than those who ate these foods the least. Vegetables rich in carotenoids include dark, leafy green vegetables, especially raw spinach, kale, and collard greens. As stated by the investigators in this study, “in particular, a higher frequency of intake of spinach or collard greens was associated with a substantially lower risk for AMD”. The authors stated, at the conclusion of the study, that “consumption of foods rich in certain carotenoids, in particular dark green, leafy vegetables, may decrease the risk of developing advanced or exudative (“wet”) AMD, the most visually disabling form of macular degeneration among older people”. A second study investigating nutritional factors and AMD, supported by the National Institutes of Health/National Eye Institute, showed that high levels of antioxidant vitamins and zinc significantly reduced the risk of advanced age-related macular degeneration and its associated vision loss. This study, known as the Age Related Eye Disease Study (AREDS), was truly another landmark study for patients with AMD. The investigators state, “people at high risk of developing advanced stages of AMD, a leading cause of vision loss, lowered their risk by about 25 percent when treated with a high-dose combination of vitamin C, vitamin E, beta-carotene, and zinc”. Interestingly, the participants in the study who had either early AMD or no AMD did not appear to benefit from this antioxidant and zinc regimen. “This is an exciting discovery because, for people at high risk for developing advanced AMD, these nutrients are the first effective treatment to slow the progression of the disease,” said Paul A. Sieving, M.D., Ph.D., director of the National Eye Institute. “AMD is a leading cause of visual impairment and blindness in American 65 years of age and older. Currently, treatment for advanced AMD is quite limited. These nutrients will delay the progression to advanced AMD in people who are at high risk those with intermediate AMD in one or both eyes, or those with advanced AMD in one eye already”. Dr. Sieving further states that patients with AMD should understand that there isn’t a cure for AMD and that proper nutrition will not restore vision that is already lost. However, the study results also clearly demonstrate that nutrients play a key role in helping to maintain vision in people at high risk for developing advanced AMD. The nutrients evaluated in the AREDS study contained 500 milligrams of vitamin C, 400 international units of vitamin E, 15 milligrams of beta-carotene, 80 milligrams of zinc as zinc oxide, and two milligrams of copper as cupric oxide. In this study, the NEI was supported by and collaborated with Bausch and Lomb, an ophthalmic products and pharmaceuticals company that provided the nutritional supplements, financial support for laboratory testing, and distribution of the supplements themselves. Today, these supplements can be found in a formulation called Ocuvite Preservision. What Supplements Should One Take to Prevent AMD Progression? Given the findings of these studies, most ophthalmologists have begun to recommend that patients with AMD include an abundance of leafy green vegetables in their diet. Bausch and Lomb, the maker of Ocuvite, produces other supplements specific for patients with macular degeneration, including Ocuvite Extra, and Ocuvite Lutein. These products are found in retail stores and pharmacies everywhere. Macular Protect Complete from Science Based Health, Alcon laboratories ICaps, and other supplements also contain antioxidant vitamins and zinc in dosages supported by the AREDS study group, along with various doses of other vitamins and minerals, which are beyond the scope of this article. It should be pointed out that supplementation with beta-carotene, a vitamin A precursor, has been shown to increase the risk of lung cancer among smokers. However, whole food based supplementation has not been shown to increase the risk of lung cancer among smokers and, in fact, there is some evidence that whole food based nutrition may decrease the risk of lung cancer in smokers. One study showed that a higher intake of green and yellow vegetables or other food sources of beta-carotene decreased the risk of lung cancer. As such, smokers should exercise caution in consuming any non whole-food based supplement that contains beta-carotene or Vitamin A. It is clear from the studies to date that a diet rich in dark, leafy green vegetables will help to decrease an individual’s risk of developing age-related macular degeneration (AMD). It would be wise to include a serving or two of raw spinach, kale, or collard greens in your diet every day to help prevent macular degeneration and/or to help delay progression of the disease once it has begun. If an intermediate degree of AMD has already developed, or an advanced degree of AMD has developed in one eye, studies clearly indicate that dietary supplementation with vitamins E and C, beta-carotene, zinc and copper, in the doses previously mentioned, will help to delay progression of the disease. These antioxidant vitamins are readily available in a number of over-the-counter products including Ocuvite, ICaps, and many others. AMD may not be an entirely preventable disease, however, it is certainly prudent for all of us to minimize our risk. How do we do this? Don’t smoke. Be sure your blood pressure is controlled. Consume plenty of dark, leafy green vegetables along with antioxidant vitamins and zinc.